Estimating volume of larger junk and debris jobs. You can get a good idea of the amount of debris you need hauled away. With a couple of easy measurements and a couple of rules of thumb, you can get a reasonable estimate of volume of debris. The algorithm is basically calcualting cubic feet of volume and then applying a constant for compaction. Some materials do not compact, such as brick or stone. 1. Demolition: Length x width x height equals cubic yards. FEMA applies a .33 constant to measure compaction. Therefore a two-story wood-frame house 30 feet long x 20 feet wide x 20 feet high is 12,000 cubic feet. Multiply by the FEMA compaction constant .33 and you get 3,960 cubic feet. Our Junk King trucks hold 480 cubic feet, so this demolition would require about 8 full trucks hauled away. Brick wall: Length x height equals square feet of brick. You get 7 standard bricks in a square foot and you need to allow an additional 3.5% weight for mortar. Bricks weigh about 4.5 pounds each. Therefore, a square foot of bricks with mortar weighs about 33 pounds In the case of the small house, if one side is a brick skin, we have 30 feet long x 20 feet high, which equals 600 square feet x 32.5 pounds, which equals 19,500 pounds. Our trucks hold 6,000 pounds, so this brick wall requires a little more than 3 truck bedloads to haul it away. The total demolition haul away is 8 trucks of debris and 3 truck-bedloads of brick. 2. 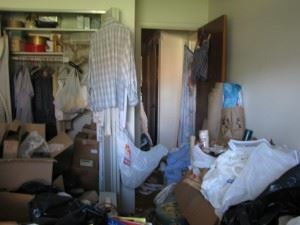 House Cleanout: This algorithm requires the square feet of living space and the height of the debris from the floor. Let’s consider a complete clean out of a hoarder situation. The two-story house has 1,200 square feet of living space. The rooms have narrow passages that comprise about 15% of the area or 180 square feet; therefore, the area with debris is 1,020 square feet. In this scenario, let’s say the hoarder piled debris 6 feet high on the floor. The volume of the debris is 1,200 square feet x 6 feet high = 6,120 cubic feet. This job requires 12 and one half trucks. You can use the same algorithm to calculate the volume of debris in a full garage or a room. A 20 x 20 foot garage piled 7 feet from floor to ceiling would have 2,800 cubic feet requiring about 5 and ¾ trucks. Sometimes, we see opportunities to “compact” the debris and save the customer money. For example, an old 8 foot tall bookcase can take up to 8 x 3 x 1.5 in volume or 36 cubic feet. If we break it into lumber, the volume shrinks to about 6 cubic feet: a 6:1 compaction. At Junk King, we give free estimates and honor our estimates. If we underbid the job, we take the risk. If we discover that we overbid the job, we reduce the invoice to the actual volume we haul. If you have questions about estimating debris volume, call us and we’ll do our best to help. The advice is free. Of course, we may need to see the debris and take measurements to give an accurate bid, but we can usually get pretty close if you have the dimensions or description of the debris. We believe informed customers become satisfied customers. Check out our dumpster rentals for super convenience. This entry was posted in Debris Removal, Fairfax Junk Removal, Junk Hauling, Junk King Fairfax and tagged debris, estimating, hauling, Junk Removal on October 21, 2014 by Alex Powers. Last updated April 11, 2018 .